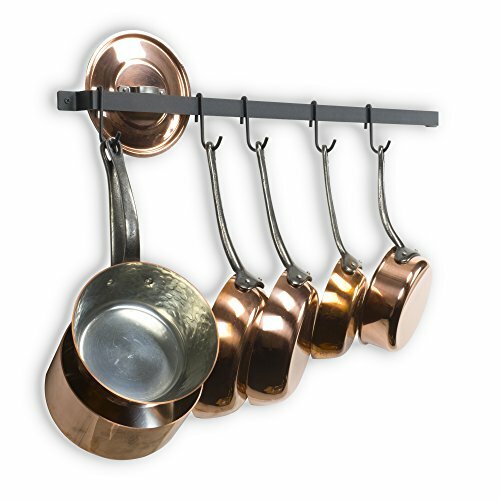 The rack is built to carry a substantial amount of weight, so you can also hang your cast iron cookware with ease. Rail Dimensions: 30" L x 1" H x 1.5" D Each Hook: 3.5"
Minimalist Design: The 30" L x 1" H x 1.5" D rail is built with durability and dependability and the sturdy construction will prevent the hooks from swaying or falling off easily. Hang it on your unused wall space and begin organizing your kitchen with ease. Hanging Utensils: With 10 hooks this rail is great for hanging spatulas and other baking essentials. Install the one or both rails over your oven, so everything is easy to find whenever you're in the mood to bake cookies, cakes, pies or tarts. Gourmet Kitchen: With the help of this kitchen wall rod you can easily find your mandolins, zesters and measuring cups at your fingertips. Hang everything where you can see to cook like a professional home chef in your gourmet kitchen. Coffee Station: Every coffee lover must have a coffee corner in the kitchen, you can hang your mugs over your coffee machine and easily brew a cup whenever you need an uplifting mood and energy to get you through the day. Multi-Purpose Organizer Rod: Each wall mount rod can be used for endless possibilities. Use it to hang your towels in the bathroom, to organize your accessories and jewelry, or use it in your entryway for hanging your coats, bags and keys.